Homespun Devotions: Introducing the "Biblical Minimalism" Brand-New Blog! Introducing the "Biblical Minimalism" Brand-New Blog! Today, I am so excited to let you know about our brand-new blog called "Biblical Minimalism!" Are you in debt and searching for God's way out? Are you burdened under a load of far too many physical possessions? Is your home cluttered and disorganized? Have you taken on a ministerial obligation that brings continual misery? Are there people in your life who are a source of constant vexation? Is your schedule overloaded and stressing you out? Do you long to live your life as Jesus lived His? If you said "yes" to any of the above, you may find "Biblical Minimalism" a place of solace and practical advice. Not that I have all the answers, by a longshot, but, my family and I are walking this path, right alongside you, and I long to share the lessons God has taught and continues to teach us along the way. 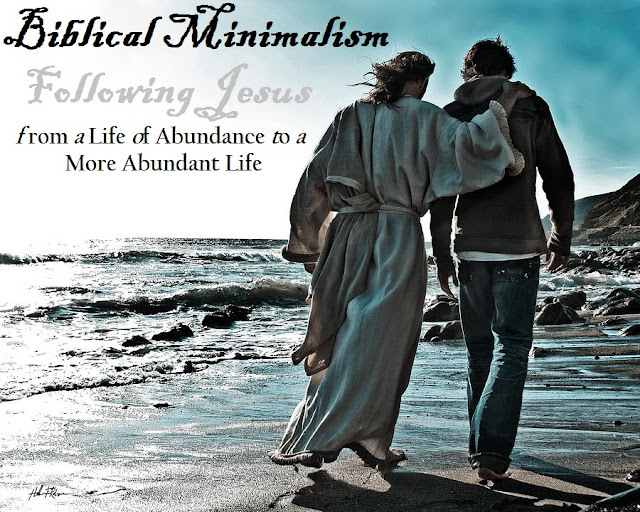 At Biblical Minimalism, you will never be judged, only encouraged in your fervent pursuit to follow Jesus toward a less encumbered, more eternity-focused life. I will continue to blog here at Homespun Devotions and conduct interviews for Inner Views, but all posts that pertain to Biblical Minimalism will be posted on the new site. I’m looking forward to following you at your new blog my friend. You are such a source of inspiration and comfort to me. Your prayers mean the world to us. Oh, Cheryl, I am excited about your new blog venture. I will definitely be following along. Oh, that is so wonderful, Patti! I am so thankful for you, my friend. May the Lord bless you so richly. Sending hugs and love your way! I just signed up Cheryl. Thanks for starting this well needed blog. Oh, thank you, sweet Regina! So very thankful for you and your support, my friend. I just followed you...see you there! Thank you, thank you, thank you, sweet friend!! Hi dear one, I will be following along also! Praying your day is blessed beyond measure. Oh, thank you so much! I trust your day is blessed beyond measure, too, sweet friend. :) It means so much to know you will be following along! It sounds wonderful, dear Cheryl! I love the image that you shared, too. I am so glad you like it, my friend! Oh, that image just calls to me...HE calls to me. When I think of His beckoning call, it surely makes me want to do all I can to follow Him. Thank you so much for your precious encouragement! How exciting Cheryl about your new blog. That image is breath taking. Gave me the Holy Bumps. I will be hoping over to your new blog and visiting. Happy Mother's Day sweet woman of God. It gives me the holy bumps, too, my friend. Just so compelling. I cannot begin to thank you enough for your loving support and encouragement and am SO thankful you will be joining in! God bless you! Congrats on starting a new blog! I wasn't sure what Biblical Minimalism is but will be looking forward to seeing some of your posts in the future. Thank you so much, Karen! I am thankful to have your presence here. God bless you! Thank you ever so much for your support and encouragement, dear friend! Your prayers are an invaluable gift. I am praying for you, too, and trusting the Lord to send healing to you and your husband, too. Sending love and hugs back to you! Neat to see your new blog! All the best to you in this venture. I am so glad I won "The More of Less" in your giveaway a while back. That was a great book to read. Just followed your new blog and signed up for email updates - looking forward to hearing more from you on this important subject! This is exciting You will offer so much practical help. I want to sign up too! I did ask that Christian author about self-publishing but she never got back to me. I think the "cyber goat" ate my message, as she would put it. Oh, thank you so much for following along, Mary! That truly means so much to me. That is hilarious to call it the cyber goat...so THAT is where all of that lost stuff goes!! LOL! Sending love and hugs to you today! I'm looking forward to your new blog and the topics in which you will be Sharig. Oh, what a sweet way to envision the new blog! Wouldn't that be a wonderful thing? I am so grateful to you for your kind words and comforting encouragement. Aunt Vaida's service is tomorrow, so if you think of it and see this message, please pray for Uncle Nelson. He is having a most difficult time. Sending love and hugs to you, sweet friend.